We’re about 24 hours removed from the start of yesterday’s game. There’s plenty of other thoughts and posts on here so I’ll try to summarize a few quick thoughts here from what we saw yesterday. – UC Davis is a very good team, but certainly a beatable team. The first half the Griz were fired up and UCD had no composure. It was looking great for a Grizzly upset. However UCD came out with good focus, solid execution, and an aggressive plan to get back in the game. Not only did it work but they blew the doors off the Griz. Davis is loaded with skill, has a very diverse offense, and a defense that plays very aggressive which paid off big dividends. UCD seems to be on the inside track to win the Big Sky, it’ll be interesting to see how they do come the playoffs. If UCD plays a team that punches them in the mouth the way the Griz did for a while, it’ll be tough sledding. However if they can stick to what they do best… they could make a deep run. – 4 more lost turnovers for the Griz and no takeaways by the Grizzly defense. Another game where turnovers doomed the Griz. In this game, unlike a few others, the turnovers didn’t set the tone early. In this case it slammed the door shut on the Grizzlies chances. The picks thrown appeared to be into good coverage and in spots where the UCD defenders could cut on the ball and beat the WR to the catch pretty easily. – Sammy Akem continues to show how damn good he’s becoming at WR. He’s had the best rise of any player on offense this season. He’s really shown great improvement on catching the ball and using his size to create mis-matches. – Pay attention to Sneed as he’s about to receive the snap, he tends to squat/crouch right before it. Davis’s defenders timed some of their blitzes to perfection on this. Sneed also can tend to rifle shorter/checkdown passes too hard when pressured. We’ve seen this quite a bit, passes that need a better touch on them are rocketed to the target and the ball bounces off the receiver. Happened a few times in the 2nd half. Sneed’s season so far has been a series of great high points and some more frustrating results too. There’s things which need to be improved mostly in the passing game for sure. I really like his fire, ability to motivate, and continual hard effort. You can tell the guys feed off this from him, and if he can work to improve some of his challenges as a passer he can develop into a better QB. – 46 unanswered points, 36 allowed in the 4th quarter. That’s just awful. – I hope the injury to Sims isn’t as bad as it appeared on the field. Also Eastwood returned but didn’t look great post-game. Those are both big losses. – Liked what I saw from Jace Lewis again, this guy will step up into Buss’s role pretty well next season as a starter. 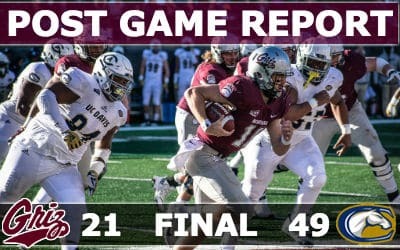 – My final thought is that while I may just have perceived this incorrectly from the stands, it sure felt like to me that the design and plan for the offense in the 2nd half was to try to kill the clock, treat the game like the Griz had an insurmountable lead, and grind it out. I don’t think this is the kind of team that can do that… and we saw evidence of that here. I know this coaching staff’s style is to get and hold a lead, but as UCD showed, they don’t give a damn about that and can overcome it. In the 3rd quarter this game turned around for Davis. The Griz crossed midfield twice but couldn’t do anything with it. When they failed to get the 4th and short, that appeared to be the moment where Davis knew they could not only come back, but get the win going away. Some personelle decisions didn’t make much sense, 3rd and medium/long plays where Akem is on the bench, a 4th and 1 where Calhoun or Eastwood weren’t on the field, and so on. I can’t say for sure why, maybe the guys were gassed at that point, the design didn’t need/use them, or whatever. I’m just a little baffled at some key points why the best option wasn’t on the field. I’ll fully admit, that’s a fan’s opinion which could be way off base. Moving ahead it’s going to be interesting to see with this redshirt rule if some guys start to get a few more looks, or if others (like Jeremy Calhoun) get shelved to save their RS. The Griz have two road games in front of them that I’m hoping they can rebound and get some wins and momentum heading into the cat game. At the end of the day here, Davis was/is the better team. The Griz fought hard early but fell apart as the day went on. I admire the fight and effort, I wish they could’ve got the win but I think this team is just too flawed to hang with the top dogs like Davis is this year. SUU is up next, hopefully the Griz can get back into their winning ways.